← My baon can beat your baon! For today’s bento, I have two very un-Japanese tiers. 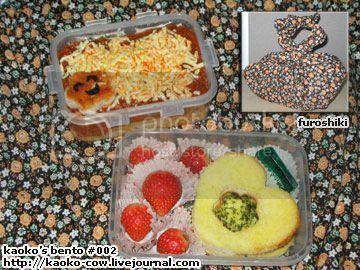 (I have yet to buy real bento boxes so I just had to make do with plastic food keepers we have at home.) The top tier holds Filipino style spaghetti with grated cheese and a happy faced bread flower. Filipino style spaghetti is something only a Filipino can appreciate, being weirdly sweet, and containing hotdogs so I won’t bother posting the recipe. I was supposed to stencil in grated cheese flowers, but it didn’t come out pretty so I just loaded it with cheese to cover up. Mental note: next time I do flower stencils, do it with powdery cheese like grated parmesan. Finally, I cut the happy faced bread flower using a canape cutter, smeared a little spaghetti sauce on it for color, and gave him a happy little smile with nori. For the bottom tier, I made a double-layered heart-shaped toast-sandwich. I cut both pieces with a cookie cutter (I’ve yet to buy bento vegetable cutters so I have to make do with canape and cookie cutters). I smeared both layers with margarine, then sprinkled the bottom layer with cheese and dried parsley. I made a window in the top piece with a canape cutter (to make the smiley face on the spaghetti) then put them together to make a flowery heart. I threw in a couple of fresh strawberries in little paper cups, and a couple of chocolate mints for dessert. And now, having written about my lunch, my appetite has been whetted and I’m staring at the clock, waiting for lunchtime to arrive. Sigh.